Gibson Keller's days are fairly routine: wake up early, get some work done, drink lots of coffee, and take care of Ellis, his older brother, stuck in wolf form after coming home from the war. It's a simple life made up of long runs on two legs - or four - and quiet evenings...until Ellis chases a handsome man off a cliff and into the frozen waters beside their cabin, changing Gibson's life forever. For Zach Thomas, buying an old B&B is a new start. Leaving behind his city life, he longs to find peace and quiet, and hiking the trails behind his property seems safe enough - right up to the moment an enormous black wolf chases him into a lake, nearly drowning him. Discovering werewolves are real astounds him, but not as much as the man who rescues him from the icy water, then walks into Zach's heart as if he owns it. With less than 100 pages to this story there's a lot happening and lot of groundwork is being laid out for not just this story but I suspect some of it will become more relevant as the series unfolds. As well as Ellis who I'm hoping that we'll see more of some of the secondary characters like Ruth and Martha, the two women who are looking after Zach's B&B, then there's Pat Brown the son of the former sheriff and currently working for the sheriff's department himself and there's some interesting history between the Kellers and the Browns to be sure. I'm hoping that as things progress in this series we'll learn a little more a bout Zach's life before he came to own the B&B. We've gotten some glimpses of his life, enough to know that Zach was in a accident, that his family relations are strained to say the least. While this one got off to a bit of a slow start for me. I have faith in Ms Ford's ability to draw me into her stories and make me not only glad I'm reading them but want more and more...and yes, more and so far I definitely want some more of Gibson and Zach but I'd also like to find out more about Ellis and while he really didn't seem to be a nice guy much less a good one. I have the feeling that there's possibly more to Pat Brown than we know and I'm sure that it could make for an interesting story as well. I think at the end of it all for me I'm on board with this series not because of where Ms Ford has taken us but because I'm curious to see where we have yet to go. Now on to the audio portion of this audio book... Derrick McClain was the narrator for this audio book and overall I enjoyed things except for the minor glitch that Zach's voice wasn't quite what I had imagined it would be. My previous experiences with this narrator have varied and while a couple of the audio books that I've listened to haven't worked really well for me the opposite is also true and I've really enjoyed others. Regardless of whether I've enjoyed it or not I do find that in general this narrator ticks the basics on my list of 'must have's for an audio book'. His voices are varied, expressive and words are pronounced clearly and concisely but not to the point of being monotone or stilted. So overall Derrick McClain produces an audio book that can readily be enjoyed and beyond that when it comes to things like how a voice sounds we're talking about a purely subjective issue that's a matter of personal taste which to me means that it's not an issue of right or wrong, good or bad just what works for one individual and not for another. This time around things didn't work as well as they have other times, but that doesn't mean that the next time won't be an entirely different experience. While he's not on my 'must listen' list neither is he on my list of 'not in this life time' more like 'let's take this one audio book at a time'. Still at the end of it all I really enjoyed this story and can't wait to read/listen to what comes next from Ms. Ford's band of 'Wayward Wolves'. 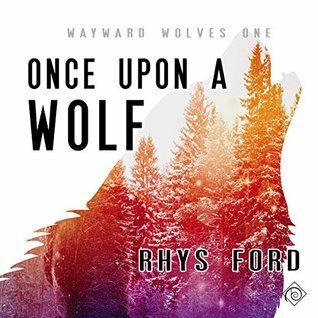 An audio book of 'Once Upon A Wolf' was graciously provided by the publisher in exchange for an honest review.